Baked penne with mushrooms and cheese - Kosher In The Kitch! 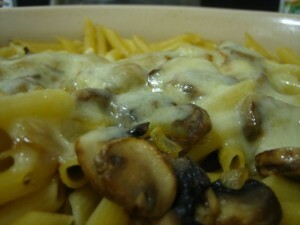 Baked penne with mushrooms and cheese - Kosher In The Kitch! 1. In a skillet, heat 1 TBS. olive oil and sautee the onions until they start to brown, then add garlic, and mushrooms. 2. Boil water and cook penne for 5 minutes. Remove from heat, and drain under cold water. 3. In a casserole dish, add about 1 teaspoon of olive oil and spread on bottom (this is optional, and if you don’t like your pasta to be too buttery skip this step). 4. Add pasta and salt, pepper. 5. Cut the butter into about 6 pieces and place throughout the dish. Miix pasta together. 6. Spread the onions, garlic and mushrooms on top. 7. Place the slices of cheese across the top. 8. Bake at 350 for about 15 minutes, until the cheese has melted.